Sect C, Ch 11 - Why Aramaic? Bible critics at one time (1800’s and early 1900’s) claimed writing was not developed until well after the time of Moses. The Moabite Stone erected by Mesha, king of Moab about 850 BC tells of Moab’s revolt against Israel’s King Jehoram and is in agreement with the Old Testament account. Siloam Inscription records the construction of a tunnel in Jerusalem from King Hezekiah’s time and work recorded in the Bible from 700 BC. Library of Assyrian King Ashurbanipal (650 BC) has been recovered containing thousands of tablets. The Jewish Talmud (a code of traditional laws) required that Scripture be copied on animal skins. Apostle Paul asks that “the parchments” be sent to him in 2 Timothy 4:13. Parchments were leather portions of the Old Testament. Made from the pith of the swamp grown papyrus plant. Pressed, dried and polished. Inner edge (or, both edges) were attached to a wooden roller. During the years 50-200 AD the codex developed. A codex is simply the early form of a book. The papyrus sheets were stacked and bound like book. Christians copying the New Testament letters helped advance and popularize the use of the codex. Moses used portions of historical documents that had previously been written by men of God who had been eye witnesses of the events they recorded. He compiled these documents and edited the book of Genesis by using writings of men like Adam, Seth, Enoch, Noah, Shem, Abraham, Jacob, Joseph, etc. Genesis 7-8 – inscription or document of Noah written like a journal or diary. Josephus (wrote Jewish history around 70-90 AD) records (in Against ApionI.8) that the Old Testament canon developed between Moses and Artaxerxes or until the time or Ezra, Nehemiah and Malachi. This would be the years 1400 -450 BC. From the beginning these letters were considered authoritative. Then authoritative written narratives of the life of Christ had to be established. The Hebrew organization was different than our organization of the books. The later Prophets – Isaiah, Jeremiah, Ezekiel and the 12 minor prophets. Some books are classified in different groups. For example we call First and Second Samuel history. The Jews classified it with the prophets. The twelve Minor Prophets are one book. First and Second Samuel was one book. The same is true for 1 and 2 Kings and 1 and 2 Chronicles. The writers of Joshua, Judges, Samuel and Kings were considered prophets for they wrote with a prophetic outlook. Almost all of the 39 Old Testament books were originally written in Hebrew. After exile to Babylon (500 BC) Aramaic became common language of Palestine. Nehemiah 8:8 seems to indicate that the people of Nehemiah’s day needed to Hebrew scriptures translated into Aramaic to be understood. The Dead Sea Scrolls reveal the exact same break from Hebrew to Aramaic in Daniel 2:4b in two different manuscripts. These manuscripts switch back to Hebrew at the same place at the end of chapter 7. The Dead Sea Scrolls match our modern manuscripts exactly after more than 2,000 years of being copied. Jesus spoke Aramaic. This explains why sometimes when the gospels quote Jesus the quotes may slightly vary in wording. Jesus would have said it in Aramaic but the writers translated it into Greek to record it for all to read. The New Testament was recorded in Greek. Greek was the universal language of the day. Original letters written on papyrus have perished. Early Christians made many copies of these letters. The hand written copies are known as manuscripts. The word “manuscript” is abbreviated with by the letters “ms” or “mss” for the plural. It is important to know how old a ms is. Some have dates written on them. Many of these things would change as writing style and the writing format changed. Word meanings and the spelling of words changes through time so it is possible to place the ms in the correct frame of time when they were written. There is no Mark 16:9-20, but yet the scribe appears to know it exists since he left space for it in this mss. Portions of scripture were copied out to be read in a church service. Most often these are the pastor’s notes from the sermon. The scripture was written into the notes to be read during the sermon. Syriac Versions – these would be translations copied from a manuscript from the second century. Syriac was the language of nations of Mesopotamia. Curetonian Syriac - translation into Syriac has been found from 400 AD with 80 leaves. It was discovered in the 1800’s. Sinaitic Syriac – from late 300’s AD. A rescript (a manuscript that has been written over with a more recent work) has been found at St. Catherine’s Monastery on Mt. Sinai. Latin Vulgate History – The Old Latin manuscripts were becoming so corrupt by 382 AD that Damascus, the bishop of Rome, asked Jerome to translate a new Latin version. It would become known as the Latin Vulgate translation and be used by the church until the reformation in the 1500’s. It is still used by many Catholic churches today. In making his Latin translation from the Greek, Jerome combined education, consecration and common sense. A several Latin translations were already in use by Jerome made corrections n the Latin text by going back to the Greek. Jerome was reluctant to do so because he knew his work would not be well received. He completed the Gospels in 384 AD and his work was not well received by the people. The result of Jerome’s work was a 1,000 year reign of this translation in the West. The first English translations were translations of the Latin Vulgate. Roman Catholics made it the official Bible and it is still so today. The English Roman Catholic Bible is an English translation of the Latin Vulgate. If all the other manuscripts were lost we could still rebuild the exact same New Testament text in Greek just from the quotes of the early church fathers. The original autographs of the New Testament do not exist. All copies were made by hand until the printing press was invented in 1456. Errors are bound to have occurred during 1,400 years of being copied. Even with the invention of the printing press copies have been produced in mass quantities with errors many times. For example, the 1611 edition of the King James Bible had 400 errors in the first edition. They were corrected in the 1613 edition. Once an error was made it could be copied and would eventually be mixed into the text. These errors produce the need for the science of Textual Criticism. Lower Criticism – which seeks to recover the exact words used by the author in their original writing of the text by comparison and study of all available mss evidence. Higher Criticism – devotes itself to study of authorship, date of composition and historical value. This is a science developed by the liberals to undermine authenticity of the scripture. Although no two mss are exactly alike they do fall into a particular style of text. This means the variations in the Greek mss tend to fall into three basic text-types that seem to show they were copied from a similar mss. 80% of all the Greek manuscripts (Gr. mss) are of this text-type, thus it is called the Majority Text. They come from the Byzantine Empire where Greek was the native language. Most of them are from after 1000 AD. This text tends to combined variant readings to make a new one that is different from both of its sources. This text harmonizes different parts of the text by making parallel passages agree and read the same way. Many variations are obviously liturgically-motivated. It is important when it agrees with other text-types because it gives credibility to them. Some of the Alexandrian papyri come from 110-200 AD. Its readings tend to be shorter and the do not have the additional working. Greek texts that are used today for translating and study are texts that have been built out of the 1,000’s of Greek manuscripts. There are three major Greek texts that are used in translating the Bible today. Each text has a different theory on how to arrive at the best built text and recreate one that is the closest to the original. All the variant readings are displayed in the apparatus of the text. This text is based on the theory that the date and quality of the mss is more important than the number of existing mss. This text is the basis of several modern translations including the NASB and the NIV. The Textus Receptus, which is an early Greek text, was based on this same text-type but actually only used six mss. The King James was translated from the Textus Receptus. This Majority Text uses more than 4,000 mss of the same Byzantine Test-type. Any reading overwhelmingly attested to by the mss tradition is more likely to be original. Final decisions about readings ought to be made on the basis of a reconstruction of their history in the manuscript tradition. In other words they consider the Byzantine Tex-type to be original. 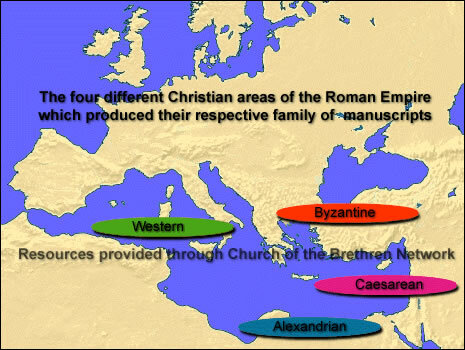 There are five strands of the Byzantine that conflict. They build a genealogy of the development fro the variations in the mss. Some NKJV (New King James Versions) give Majority Text readings in the margins. Made revisions not made by Erasmus. Erasmus had no Greek mss containing the last six verses of Revelation. He translated these verses from the Latin back into Greek. These verses contain at least 20 errors. The copyist made several errors in copying the text of Revelation which are still fond in the Textus Receptus today. Scribe mistook one word for another. Explanatory notes were written in the margin. When the mss was copied later the scribe copied the notes into the Greek text. This is rare in the New Testament and can be identified by comparing the text with other texts. They were not made by corrupt scribes trying to tamper with the text Most often the scribe feels he has come across an error and wants to “correct” the text. During copying a scribe apparently tried to change them to agree as they do in the King James. (Both say “children” in the KJ) Before the mss used for the KJ translation today existed earlier mss show that the Greek used to say “works” in Matthew and “children” in Luke. Apparently some scribe tried to make Matthew and Luke agree on this quote. The more difficult reading is preferred. Scribes would tend to smooth out the passages they felt were in error or were hard to understand. The quality of the textual witness is more important than the quantity of textual support. Textual authorities must be weighted and not counted. In parallel texts (Mt., Mk., Lk., Jn.) minute different readings are preferred rather than one that had been harmonized to match over the years. It might be said that there are 200,000 errors in the New Testament texts. What this means is there are 200,000 scribal errors in all the manuscripts, but this is a misleading statement. This number is arrived at by counting all the variations in the 5,000+ Gr. Mss. If one word (the same word) is misspelled in 4,000 mss that is counted as 4,000 errors. What happened is one scribe misspelled one word and it was copied at least 4,000 times. We have 5,000 Gr. Mss. If we only had 10 Gr. Mss there would not be 400,000 errors. Why? There would be errors but we would not be able to identify them nor judge them. So, the more manuscripts (mss) you have the variations you have to use for a more accurate job of checking and identifying the original. Example: in a copy of the printed Greek Text you could turn to the page with Matthew 11:19 on it. It might have 13 verses on that page (Mt. 11:10-23). The bottom of the page would show that there are 9 variations in those 13 verses: 1 variation is the question of “works” or “children”; 5 variations concern the omission/addition of words like “for”, “and”, “the”; 3 variations concern different forms of the same Greek word. Often variations are changes in Greek spelling over the years. The same ting happens in English. This can be seen when a comparison of the 1611 KJ Bible is made with a modern copy of the same KJ Bible. The spelling of many words has changed. Variations include grammar and occurred when grammar rules changed. Some variations occurred when vocabulary and word meanings changed. In all these cases it is simple to identify when, where and why the change in the text occurred. The best Gr. Text is then easy to develop in these cases. Even if all these issues could not be resolved the overall meaning of the scriptures would not be lost of changed. Some variations include whole verses or several verses. No early ms except the Codex Bezae (which is known for peculiar readings) has the story. This does not bring doubt on the text but it does bring doubt on if this story was in the original. The story may be true, but it was not originally in the scriptures. American Standard Version brackets the story. No Gr. Mss earlier than 600 AD has this quote. American Standard and Revised Standard Version omit this. His 1st and 2nd editions did not include 1 Jn5:7 because there were no Greek manuscripts with this verse in it. A controversy arose because the verse had been in the Latin translatins up to this point in history. Erasmus insisted he was right according to the Greek manuscripts and promised he would add it into his text if one single Greek manuscript could be found to support it. Wiliam Tyndale made the first copy of the English NT and used Erasmus’ 3rd edition. From Tyndale in 1525 to KJ in 1611 1 John 5:7 was in the English Bible. 1 John 5:7 has no evidence of originality. Only three Gr. Mss have it and these all show that they were translated back into Greek from Latin. These are all substantial variations but make no bearing on the meaning of the text nor the understanding of the divine revelation. These are textual issues we may want to ingnore but ignorance solves no problems and gives the critiecs the advantage. Variations such a s1 John 5:7 and John 7:53-8:11 are surrounded by consistent evidence that leads us to a clear decision concerning originality. Mark 16:9-20 is more difficult and even indecisive. Irenaes (100’s AD) makes a statement concerning Mark 16:9-20. He also said that Mark was the author of the book we call Mark. Codex Sinaiticus leaves room between Mark and Luke for the verses but they were never added in. 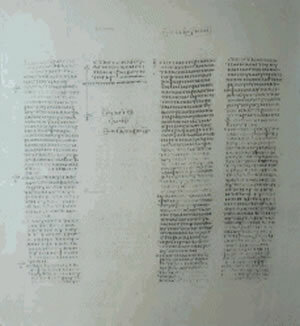 This is a page of Codex Sinaiticus. Notice the empty column. This is the end of the book of Mark with space left for Mark 16:9-20. If these verses were taken out the concepts are still solid from other verses and Bible records. What are some writing materials used? Did Moses use previously written historical documents to compose the book of Genesis? How did the Hebrews organize the Old Testament books? 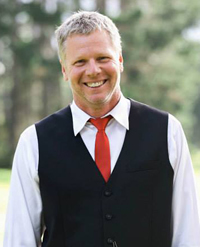 How do Christians divide the Old Testament? What were the three original languages used to write Scripture? What is a uncial? What is a minuscule? Explain the difference between lower criticism and higher criticism. Name and define the differences in the three families of text types: Western, Byzantine and Caesarean. What is an eclectic text?